The trust was young and it was fragile but in its actions it would gain the nourishment of trust and through that it would gain vital strength. 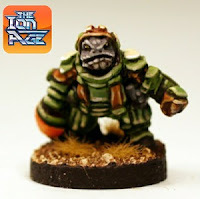 It had been only three standard year cycles previously when Ambassador Throaq of the Prang had offered peace and a pact to act alongside Humanity in defeating not only the raiders of his own species but also the looming menace of the Khanate. General Canvarus, formally of Faercycle II was promoted to knightly rank by the Reord who spoke for the Council of Addan in this and given the quest of managing the military affairs of the two space faring armies in the Camarthen cluster. 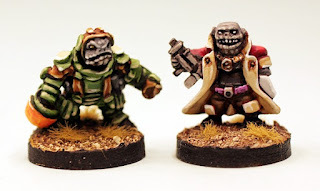 At first the alliance came near to faltering when unaware Condots in the service of the Throne fired upon detachments of the Prang Army on the nightmare world of Mim II while hunting raiders who had carried off goods and more importantly the retro-psychotics needed for life upon that world had burned the domed settlements to the purple razor grass. Apologies were made for this and accepted. Next came the pitched battle in orbit and then upon the soil of Draff where the raider fleet of Captain Vozer was decisively defeated by the Dogat-Cenga of Commander Rotza alongside the 159th Knightly Regiment of Prydia in a fusillade of beams and bullets at the aluma mines of Draff III. Celebrations were had afterwards and friendships of fire and threatened death forged. In 4334 IC contact was lost with the populous world of Myrdan III which had been a target of Prang raiders in 4328 IC and thus had been given a garrison of a hundred Dogat-Quals of Prang Army, some two thousand soldiers with their supporting vehicles and equipment. This garrison was joined by the ten thousands of the 807th Muster Regiment and the 712th Regiment as some two hundred thousand veteran Planetary Militia all centered around the city of Yellatan upon the Vale of Down; a natural wonder. It had been mostly quiet in the intervening years and the garrisoned Prang had formed bonds with the local Humans offering their great physical strength for farming and industrial tasks and teaching lessons of their music and crafts. Regular contact was lost as several fast ships moved in system. A transmission was made by emergency Ancep Generation which gave the dragon rampant warning. The attackers were of the Shia Khan Empire. It took two weeks for the joint fleet of Commander Rotza and General Lord Canavarus to make the transitions needed to arrive into Myrdan space. Upon the arrival of the stellar vessels of the joint fleet in system contact was restored to a besieged Yellatan which was desperately holding the line again four full Khanate Legions and an estimated Malig horde in the hundreds of thousands. Myrdan III a jewel of a world could not be allowed to fall into the hands of the Shia Khan. Reports had been filed from other worlds in the greater Camarthen cluster which told of isolated or small scatterings of Dragonships wreaking havoc having evaded the space blockade around Camarthen Prime. Few had been this far away from the site of the Matter Gateway and they had all been stopped by harassed Prydian forces often at great cost. This would be a larger task. While most of the planetary landings took place aboard Cassillis and Moat types of portable castles dropping from the skies on columns of fire Commander Rotza offered the opportunity to try a more exotic means of reaching the fields of Myrdan III. Discovered on Progea the home world of the Prang race and having been there for eons beforehand an ancient device which could transport matter instantaneously was located on Rotza's flagship. Though it used similar principles to the Ancep Drive it was far, far more advanced and precise. It was not understood by the Prang. Its expansive raised floor grid could hold over a hundred armoured Prang troops and then deliver them in a blinding flash anywhere within a direct line of the ship to a high degree of accuracy. The exotic teleportation device was used to great effect to place Retained Knights as well as Desteria into the vulnerable rear of the alien foe and to put Prang down into the besieged city directly through the raised Hurwent Shield. Despite repeated requests Commander Rotza did not allow Prydian fabricators and experts to examine the teleportation device despite Starvaulter imposed asking. The fighting is well under way for control of the lush farming world and with further Prydian and Condot regiments arriving it is expected that the Khanate will be expunged from the Mrydan system soon. Prang and Human fight side by side and despite their different methods of war, weapons and physicality they are allies. This will matter all the more in the war again the Khanate as well as all the other threats that lurk within the Dolo Clouds and the vast expanses beyond the Prydian Precinct. This month from the talented hands of Eli Arndt will come two more packs and a platoon set of the mighty alien Prang Army. These have been eagerly awaited. The codes which will be release next week on the 13th July at The Ion Age for the Prang Army are as follows and are all our releases for the month. The platoon pack will include all twenty of the poses from the four Prang Army packs plus an extra, only found in that platoon code, character miniature. We will give you large photos of all of them next week but for now here is the platoon special miniature Prang character who could be anything from an officer to a pilot or vehicle crew or technical support. Fantastic! These are adding to the codes already on the Prang Army page of the website which cover the army and the Prang Raiders. IMP47 Bin Bot, IAFP10 Prang Character, IAF006 Legionary (17mm) for scale. 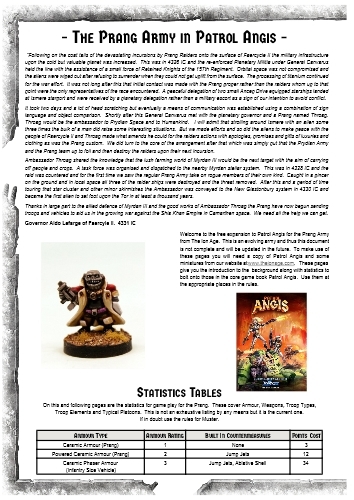 Towards the end of this month we will be updating the free PDF download for Patrol Angis which gives you game statistics and force compositions for the Prang Army. This update will expand upon the vehicle list for these aliens as well as their bike, battlesuit and portable weapon options. All of this working towards the day when the children of Progea get their own full all arms force! So not long to wait and the molds are spinning now getting the stock ready.